My most viewed post on this blog is the one where I listed the many things this Government has done that have had a negative impact on our education system. The Destruction of New Zealand's Public Education System will shortly have 50,000 views and has been republished on a number of other blogs. The damage done to school cultures and teaching and learning through National Standards has been documented in Martin Thrupp's internationally recognised qualitative research. 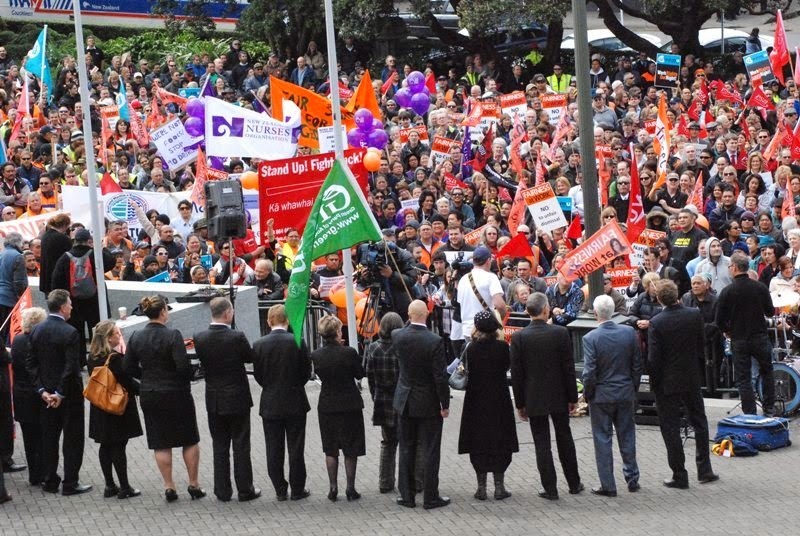 Teachers are about to have their professional body, The New Zealand Teachers Council, replaced by EDUCANZ which will no longer have representatives appointed by teachers and political appointees will lead the profession from now on. With the introduction of the Government's Investment into Education Success (IES) the leadership of our schools will be answerable to the Ministry before their local communities. The Government has successfully removed the professional voice from the leadership of the education sector and has ensured there is total political control. Despite the fact that New Zealand has been a world leader in education for the last 70 years, this Government has decided to introduce overseas models, like Charter Schools, from countries ranked well beneath us in international assessments. While education practice had been evidence based, and any changes were informed by our own contexts, this all changed. Our most respected education academics were not being consulted and it seems Treasury has become the dominant source of education advice. According to Treasury education should be data driven and under-achievement is being blamed on teacher performance rather than socio-economic factors. Teachers now expected to meet the Government's goals rather than meeting the real needs of children, which are often wider than literacy and numeracy and economic drivers. Teachers have been bullied into submission with National Standards being legislated into law and boards and principals threatened with sacking if they didn't comply. Under IES, Executive Principals will have a $50,000 increase in pay and Lead Teachers could earn $30,000 more (this is a substantial increase to current salaries). Teachers were dismayed that such a large amount was being invested into management when they saw greater value in properly funding Special Education and providing more resources for high needs and struggling children. Having a principal on a high salary is going to make little difference for a teacher with a class full of children with English as a second language or from impoverished backgrounds. In meetings around the country 93% of teachers rejected the new system and demanded to be heard. The Government's steamroller approach to introducing ideological change was slowed as it realised that teachers had lot of support from parents who had first hand experience of the limited resourcing available to their children. Most school communities are also very supportive of their schools and don't see the teachers as the problem as the Government has claimed. The Better Plan being promoted by teachers made a lot of sense to parents. Massey University reviewed the literature the Government had provided in support of IES and found that what was being planned was not really justified by the research and is therefore unlikely to be successful. With most teachers rejecting the IES plan, and the evidence for it not stacking up, the Government has been backed into a corner. For the first time in six years there will be a genuine collaboration between the Ministry of Education and the profession to look at good practice around the country and documenting what is already successful in meeting the needs of children. The hope is that funding and resources will be better directed into where it will make the most difference and a 'better plan' will come out of it. The education sector has withstood an unjustified but severe beating under National. The public criticisms of teacher quality, the bullied changes and the poorly implemented Novopay have contributed to low moral, a high level of frustration and children suffering. For the first time in six years the profession has an opportunity to turn the sector around and to make the real needs of our children (in a New Zealand context) at the front of change once more.